Do you feel like quitting poker? Impossible to win lately? Suckouts piling on top of suckouts and you feel like you are at the end of your rope? Well first off, believe me, I have been there too. Countless times in fact. This is not an easy game. In fact it will test your sanity again and again. The best thing to do when you feel like quitting poker is to find out if your poor results are simply a temporary downswing or a longer term issue. You should also take a step away from poker for awhile in order to clear your head and rediscover your passion for the game. 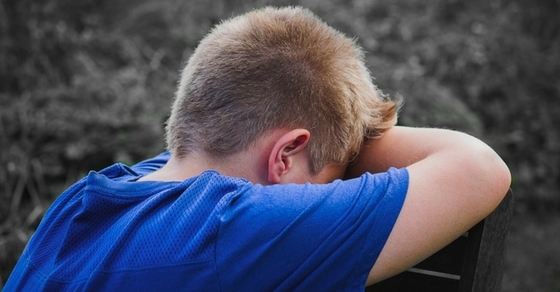 Remember that everybody feels like quitting poker sometimes when the cards go really bad, you are not alone. But this is a fairly simplistic answer so let me offer you some deeper advice on what I have done when I feel like quitting poker, as a long time professional player. First off let's talk about the difference between a downswing and a long term systematic history of losing at poker. A downswing is a temporary period of breaking even or losing. This means that in normal times you are actually a winning poker player. In other words you turn a profit over a period of months, years etc. A long term systematic history of losing however is much more problematic because it means that you haven't actually figured out how to beat this game yet. Unfortunately this is not something that I can solve for you in a short little article like this. My suggestion is to focus on re-learning the fundamentals and figure out how to beat the bad players in low stakes games. 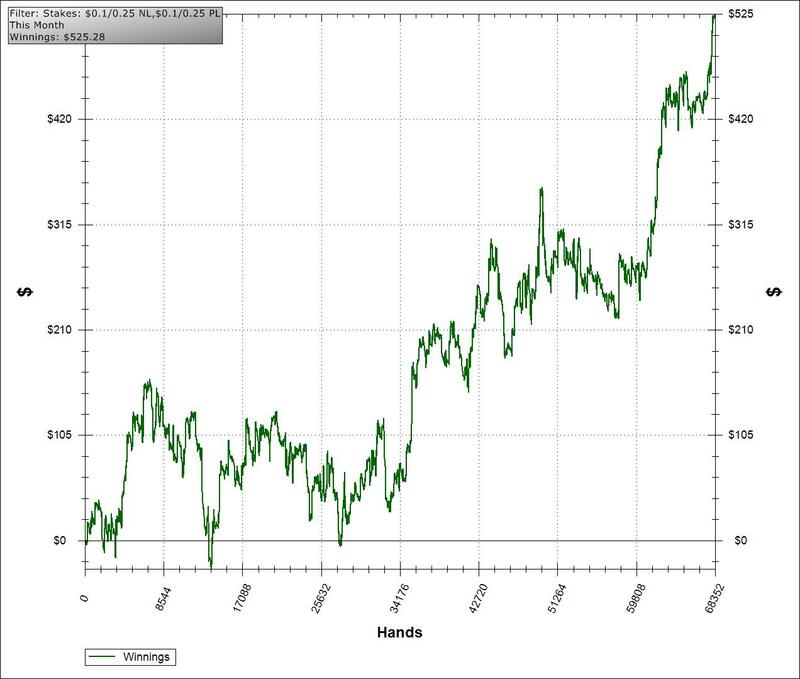 I believe that anyone can learn how to beat the very lowest stakes (at the very least) if they are truly willing to put in the effort to learn the strategy and then apply it consistently at the poker tables. Downswings though are a natural part of the game that happen to everybody. And yes, they even happen to the best poker players in the world. Therefore, it would be foolish to let your emotions get the best of you during these times and quit poker over something that ultimately isn't even real. You have to remember that downswings never last forever and if you are a winning poker player, then you will eventually be back to your winning ways. The above graph for instance represents a very typical downswing in poker. I was making absolutely 0$ at the 30k hand mark. That's an entire month of play by the way for many people who play regularly online and several months for someone who plays live. I should be freaking out right? Losing my mind at least? Nope. Because you can see what happens by the end of the graph. 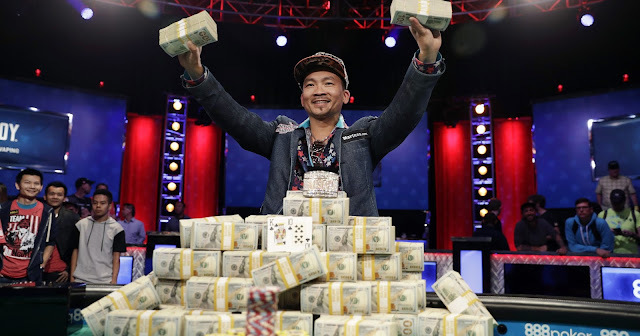 Winning poker players eventually win. But what should you do if you really don't win at poker? What if you have been playing poker for years now and you are still not a winning player? Well, I am not going to give you some sappy cliche like "quitters never win" or something. Because while that is obviously true in theory, if this game is making you miserable, then maybe you should quit or at least take an extended break from it. There have been several points in my poker career where I felt like quitting poker entirely. I knew I was a long term winning player but the beats just kept piling up for months on end in some cases and it was driving me mad. There was no end in sight. I am talking downswings over 100k hands. And I even started to question whether I was actually a winning poker player or not anymore. Maybe I wasn't as good as I thought I told myself. Maybe I was just on the craziest heater in the history of poker and it's all going to finally come crashing down now. These are the kinds of irrational thoughts that downswings can make you have. So during these periods I stopped playing poker for several weeks in many cases and just took a nice long sabbatical from the game. This really helped me reset and just get my mind away from the daily grind completely. But my passion for this game always brought me back in the end. I knew I couldn't stay away forever because I enjoy playing poker too much. This is something that I just truly love to do. You need to ask yourself the same questions even if you have no history of winning yet. Do you truly love playing this game? If so, then perhaps all you really need is a temporary break to reset your emotions for awhile. Something else that has helped me tremendously during periods of intense losing is staying within the game but in a non-playing capacity. 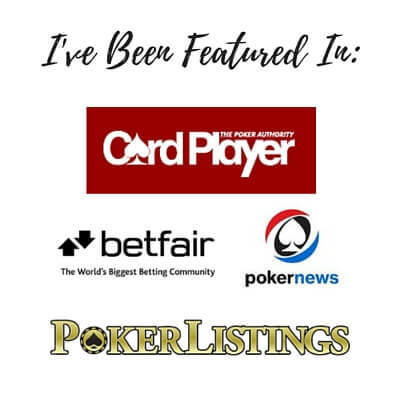 So I would write about poker on this blog for instance, make videos on Youtube or even do some coaching. These are all ways to keep your head in the game but not deal with the daily stress of grinding when you are constantly losing. 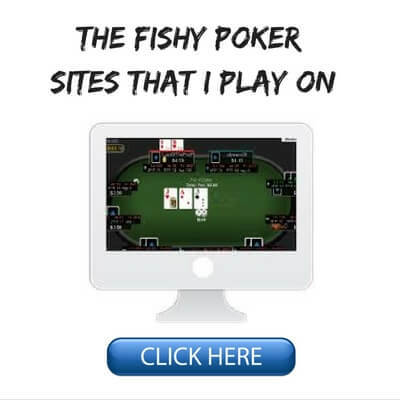 And if you are a professional poker player then you really do need to learn this skill of branching out. Because believe me, burnout is a very real thing. I know that for me personally after grinding 24 tables online for years and years on end there were simply points in time where I couldn't do it anymore. I was sick of the endless button clicking. I just needed something, anything, else for awhile. The other great thing about expanding away from the tables is that it allows you to continue to make a side income while imparting your knowledge to others. Too many poker players (especially pros) in my opinion make the mistake of sticking all of their eggs in one basket and just trying to endlessly grind their way to the top. Sounds good in theory but rarely works out well in reality. You can look at nearly any top pro out there and you will see that they have all learned the art of branding themselves and making money away from the tables as well. Staking other winning poker players is another great way to do it. Love him or hate him, this man is a genius at self promotion and personal branding. 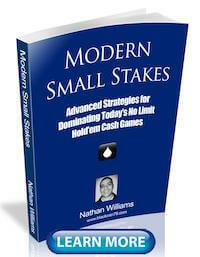 If you are not a winning poker player yet though, then this is the perfect time to devote to studying the game. Now is the time to finally fix all those problems that are holding you back. You can do this by reading poker books, studying poker courses, studying your own hands, posting your hands on a forum or even hiring a coach. I have made some of my greatest gains in poker knowledge during these periods of losing because I was intensely motivated to find the problems and fix them. But ultimately the only thing that is really going to get your through when you feel like quitting poker is finding your purpose in this game. Look, I am not going to sugar coat it. Most people lose at poker in the long run. This is just a cold hard reality of the game. 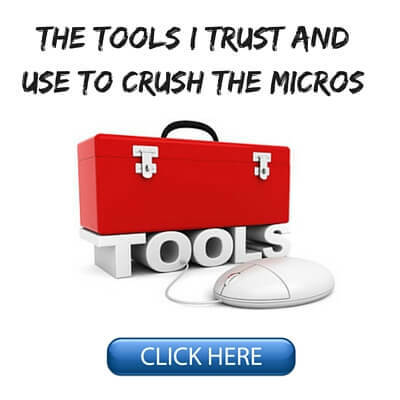 No matter how many articles or books I write about crushing the micros there is a substantial portion of the population out there who will (for whatever reason) just never figure out how to put the pieces together and make it happen. But not everyone plays this game to "go pro" or become famous, win bracelets and make millions. Most people would like to win of course but it is not the be all end all for them. Often they already have a good job, a family and a busy life outside of poker. Maybe this is you and there is absolutely nothing wrong with that. In fact most people, both pros and amateurs alike, simply play this game for fun. You know that feeling when you first sit down to play and the rush of the first big hand? You know that feeling when you reach the final table and the big score is finally in sight? Ya, that's why we play poker. For such a simple little game where you only get two cards and have to make the best 5 card hand by the end, the possibilities seem so endless. And also, let's remember that when things actually do go your way at the poker tables (and they will believe me), I don't even need to tell you how awesome it is. Every downswing also has it's twin cousin which is called a heater. And this is truly why we play this game. I will never forget my first cash game heater or the first time I won a poker tournament. It was for something like $800 which most pros would consider pretty silly. But I will tell you that it meant so much to me at the time. I was literally on top of the world when I won that tournament for $800! Vegas and the effing Mirage were next! So the bottom line here is that you need to ask yourself why you play this game. Does your passion for poker ultimately outlast this recent bad stretch of cards? 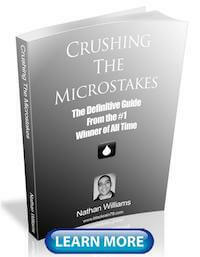 Does it even overcome a long term systematic history of losing so far in your poker career? If so, then maybe all you really need is to just take a break from the game for awhile. Just go do something completely different. Get outdoors and enjoy the beautiful weather out there. Go camping, go surfing, go hike that mountain. Or get mad and go finally find the reasons why you are losing. I know that this is much more my personality. 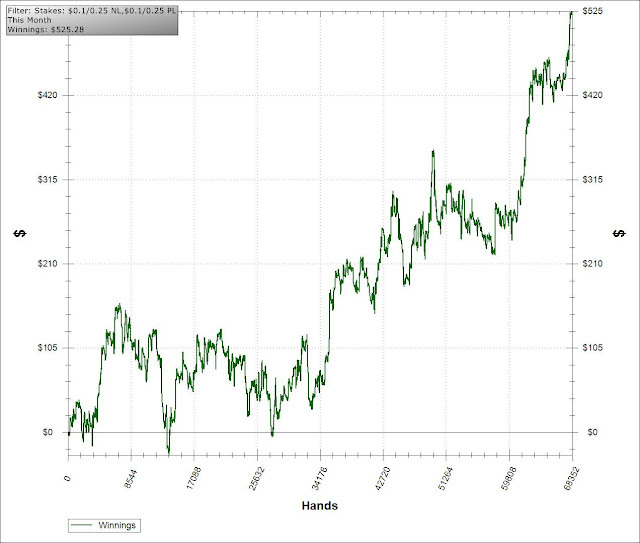 I will often just lock myself in a room with PokerTracker for days sometimes when I am losing. And then you can come back to the game when you feel ready, and on your terms, with a clear head and a renewed enthusiasm to enjoy poker again as it was meant to be. A very simple yet fun little game where if you play your cards right, anything is possible. I hope that this short little article helps some of you who might feel like quitting poker right now. Believe me, I have been there many, many times. And ultimately I am glad that I did not quit because this game has been very good for me and even changed my life completely, allowing me to turn pro and travel the world. But I also know that poker is one of the hardest things that you can possibly do at times. This is without a doubt the most mentally challenging game I have ever played. It has had me very close to the looney bin more times that I care to admit! However, I think that for most of us that have been playing poker for awhile, we do it because we have a deep passion for this game. This is why so many people "quit poker" and then you see them back at the tables again next week or next month. Because no matter how good you are or what your past results indicate, there are going to be periods of prolonged losing sometimes. As I often say, this game will eventually humble absolutely everybody. So this is why it can be a good idea to just get away from the poker tables completely sometimes. 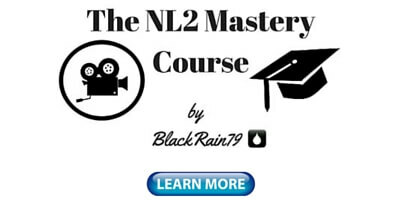 If you are a winning poker player this can be a great opportunity to take up teaching the game. You can also turn a nice profit by simply staking other winning poker players as well. But this is also an excellent time to improve your game and finally plug some of those leaks of yours. 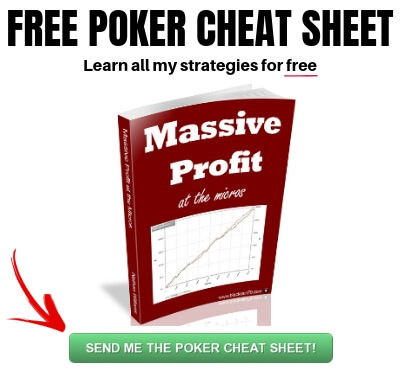 This is especially important if you haven't figured out how to become a long term profitable poker player yet. The bottom line is that no matter how frustrating poker can get at times there are very few of us that truly want to quit this game completely. Always remember what your "why" is in poker. Why do you play? If the answer is because you truly love this silly little card game like I do, then I will see you back at the poker tables next week! 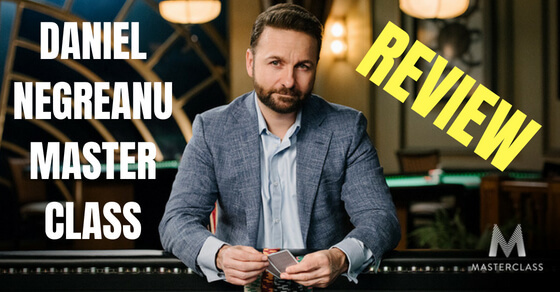 Let me know in the comments below if you feel like quitting poker. If you found this post helpful, do me a quick favor and hit that "Like" or "Tweet" button below. Thanks! Thanks Nathan, it was encouraging to read this article. I play on line poker on a regular basis and I'd like this to become my job one day. Yesterday my friend and I went to the casino (my friend is a complete amateur) for a tournament of 80$ buy in. I busted at the end of the 3rd level. After not having a single good hand for the whole session and before blinds killing me, I see AQs, I go all in from CO. Calls SB with ATs, and a T on the river. Bye bye tournament. Not bothered, is not my first bad beat. I walk around and I see cash tables NL 1/3, I think "sweet, that's what I do 100% of my time". After watching few orbits at one table, I see 3 big whales and I decide to sit and play. I have 120$ in front of me. Few hands later I double up vs one big fish. "Great I think, at least I got back the buy in of the tournament". The day had a different plan though. Few hands later I get involved in another hand. I open from MP with AQo and the fish who gave me his stack before from BTN calls. BB calls as well. Flop Q 8 6 r, sb bets 30$ I make it 90, btn calls, sb all in 70$. I call, BTN calls. Turn 5, I check, BTN goes all in (probably 100 bucks or less). I call, River 4, BTN shows 87s. I spoke with my coach and I know that I didn't play bad my hand, but it feel so frustrating. I put so much hours into studying and yet, sometimes I end miserably. but this game shows me that I have to be ready for anything. I'll learn it one day, I know it because quitting is out of question. I'll get there one day eventually. Hey Dionis glad this article helped. Your hands definitely illustrate the point that you can do everything right in poker but still lose for days, weeks or even months sometimes. This is the hardest part of the game to understand. 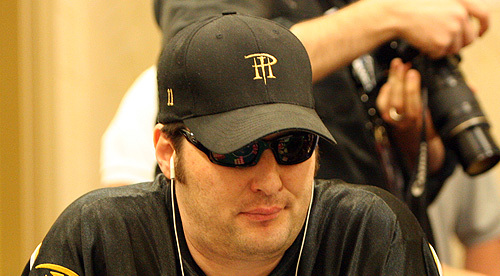 One of the greatest article that an honest poker author could write. The contents of it should probably be one the first things that a beginner should be taught, i.e. what he is about to face. Thanks Anton, appreciate the kind words! This is a fantastic article! One of the best I've read! This past week has been awful for me. But after working on tilt issues and exercises to help with that I'm happy to say I didn't jump up stakes and lose my bankroll like I usually do. Tomorrow is another day. Thank you Brian and excellent job. Progress is progress, push through it! I hope sometime you delve deeper into staking, because it is such an odd thing to me. I feel like I am really missing something but if this is such a hard game to win, what is the likelihood of finding a winner who needs backing? obviously >0, but . . .
Johnny Bax has probably made more money staking winners than by playing, but he's Johnnny Bax! do you think you will write an article on staking? do you have experience (or better still, a side income!) from staking? I'm not trying to drag out your personal business or bust your chops, but it seems like it would be almost as tough to make money staking as it would to play. and it is VERY enlightening. I know that he has a stable of 20+ players and hires a full time manager to keep track of the whole operation. Regarding winning players needing a stake, it happens more often than you might think. I personally have been staked in the past and it is just because I didn't have the bankroll at the time to play in higher stakes games. First I wanted to thank you for all Help you give us. - How much session we permit our self in a day using the % above ? - If we feel that it's a bad swing move down the limite immediately even if we have more than 60-70 Buyins ? - What is the average ROI and ITM at the STTs ? No problem Kaidi happy I could help! I am not an expert on STTs (I play cash games) so I don't really like giving unqualified advice on them. I think a lot of my strategies will work well in STTs but it would be better to ask a real expert about specific numbers related to BRM, ITM and ROI. Thanks BR79. Thanks for all, this article is amazing for me now. Glad it helped you Miguel! Thanks for reading. Helped my despair from earlier. I get AQ fellow under the gun raises it, I call because I know he's a donk, flop comes 10JQ, he shoves all in I know I'm ahead, I can feel it in my bones, I call he turns over Q4 sweet until the utter ARGH ****** rivers a 4, put me out the tourney I nearly put the laptop through the window.